With Flatpack Festival’s Opening Night just over 5 weeks away excitement and anticipation is mounting. From 21- 31 March we will be taking over venues across Birmingham, with an eclectic line-up exploring the full spectrum of cinema old and new. This year's festival will run over 11 days with a solar powered cinema, silent film re-scored, workshops, shorts, premieres, installations, parties, music and more taking place all over the city. 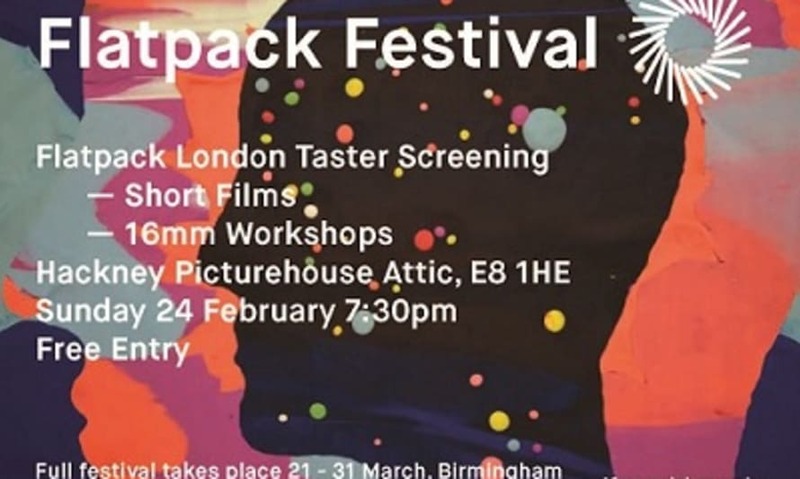 But, for one night only on the 24th February, "the UK's most creatively curated film festival" heads to the capital giving Londoners a chance to taste what's coming up in the second city. The event will be taking place at the Hackney Picturehouse, welcoming one and all, and with free entry! Join us for a drink or two and a night of offbeat shorts, weird and wonderful promos, and a 16mm animation workshop.